Spy Hunter Amazing Spiderman T-Shirt - Spiderman t-shirts are in our super hero tee shirt merchandise section featuring the Amazing Spiderman. 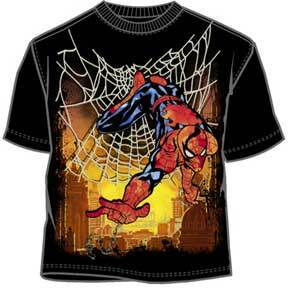 This is an officially licensed superhero tee shirt from Marvel featuring the Amazing Spiderman shooting his web in a colorful design print. This tee shirt comes in adult sizes and our tees are perfect for any fan of Marvel Comics and the Spider-man comic book character. If you have questions regarding our Spiderman t-shirts, please email us with the product name and number.